he Emerald Evergreen Necklace was inspired by pine scented forests filled with majestic grandfather trees, and the magical pine cones which carpet the ground. You can see that the colors of the forest have been captured in the fine beading of precious gemstones, including: 82 carats of emerald beads, 117 carats of jadeite, highlighted by 22 karat gold beads. 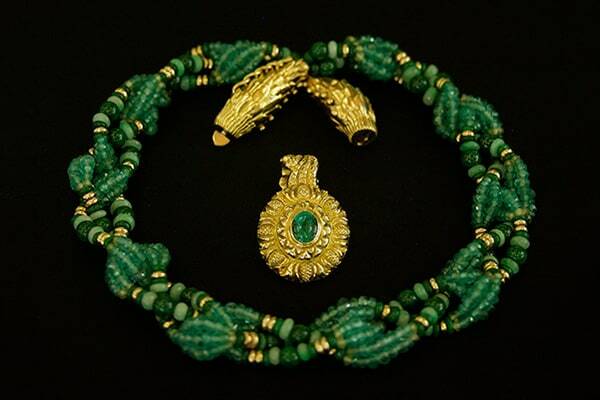 The golden clasp of the Emerald Evergreen Necklace resembles a pine cone. You can’t tell from the design is that it’s flexible, and moves just enough to hug the contours of your neck. The pendant is ornamented with pine cone imagery that encircles a natural 2.7 carat, Columbian Emerald. The Emerald Evergreen Necklace can be worn with or without the detachable pendant, which adds extra versatility to the piece. The Pine is the name sake of the Pineal Gland, the center of the mystical third. It took a total of 387 hours to complete this exquisite example of fine art jewelry that’s been inspired by the pine tree. Did you know that the pine like many of the sacred plants of old were evergreen? You’ve probably come across references to ivy, laurel and surely know of the mistletoe and myrtle. Enduring the seasonal shifts translates onto the human plane as maintaining one’s integrity through all the changes of life. Because these plants are evergreen, throughout cold winter, they symbolize the preservation of life, even beyond the doors of death. The affiliation between the pine tree and life after death is how pine wood came to be used to make coffins, and why pine cones are often found in Etruscan tombs. 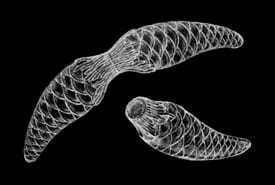 The theme of ever lasting life and the linage of the royal blood line, coalesce in one of the most important legends in ancient Egyptian mythology. It recounts how the first king Osiris was murdered by his jealous brother, who cut his body pieces and spread them across the world. The story doesn’t end here, the viral member member of Osiris, his phallus, was buried in a pine tree. With the help of Anubis, the guardian of deaths door, and Thoth the Mage, Isis recovered this part of Osiris an became pregnant with Horus, who was born to avenge his fathers murder. Echoes of this myth ripple across and through the traditions of the world, and are especially pronounced in Christianity and the Dionysian mysteries. Worshippers of Dionysus often carried Thyrsus, a pine-cone-tipped wand wrapped in ivy, as a fertility symbol during bacchanalian festivals and processions. In ancient Assyria the pine cone was known for it’s curative properties and used to clean away negative influences. This is why it the Assyrians used a pine cone to administer holy water during sacred rites. 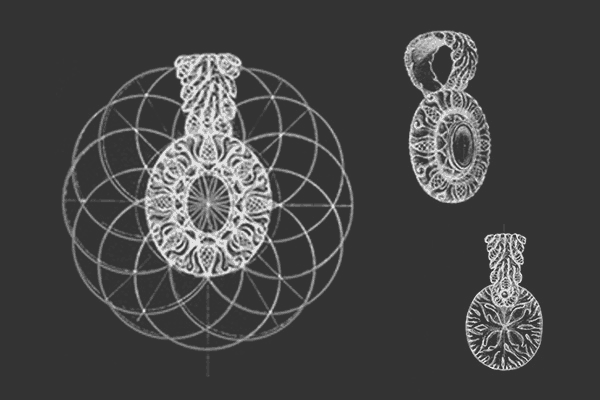 We’ve already touched on the golden mean and vesica piscis in the Golden Fish Necklace, but we haven’t really begun to explore the full breadth of it’s significance. In the sacred geometry underlying this art jewelry design you can see that twelve interlinking circles form a matrix of 8 vesica piscis’. This figure is known as the “Flower of Life”, and is one of the preeminent sacred symbols in the world. If you look closely at the design, you’ll see that the eight pine cones and ornamental details are all charted upon the intersections of the flower of life. You’ll fine out more about the Emerald Evergreen Necklace and sacred, fine art jewelry design in my upcoming film, “Life Design”.